Hello and thank you for joining BreastfeedingQuest.com. Hope you are having a joyful holiday season so far and will enjoy a warmth-filled Thanksgiving! Almost every breastfeeding mother nowadays has to express and store her milk at some point. Be it going back to work or running some errands and leaving expressed milk for the sitter to supplement; or just being pro-active and trying to create a good supply of frozen milk... just in case. No matter what the reason is, breast milk has tons of advantages and health benefits compared to formula. So go for it – express all you need! Now, when it comes to milk storage, there are lots of rigid guidelines that seem to make no sense. During my milk pumping days I struggled remembering and comprehending why some of them even existed. I am sure you’ve been there too. So let’s make it easier by explaining them! FACT 1: Stay away from clear containers and look for BPA-free bottles for storing milk. * Here is why: As you may know, BPA (bisphenol A) is a harmful chemical widely used in production of some plastics. It is infamous for causing some serious health problems, especially in infants and kids. Therefore, the general guidelines are to avoid everything BPA-related. BPA is colorless, therefore, BPA-containing plastic is usually clear. If the container packaging is not marked “BPA-free”, there is another way to check for BPA presence. Look for a triangular recycling symbol. The numbers inside the triangle that can go from 1 to 7 identify plastic materials (including BPA) that the product contains. Anything marked with 3 (aka PVC or V) or 7 (aka Other) may contain BPA. You don’t need those containers for milk storage. Keep in mind, that there are some plastics that fall under 3 and 7 recycling codes, but do not contain BPA, so seeing this code and BPA-free symbol is totally possible. But to err on the side of caution, refrain from using anything marked with 3 or 7. FACT 2: When filling the container with milk to be frozen, leave ¼ of the container empty and be sure to squeeze the air out. * Here is why: First of all, milk contains water, and as we know water tends to expand when frozen. Therefore, when preparing a container with breast milk to be frozen, leave some room for milk expansion. Secondly, as with all the other products that go into your freezer, you should let as little air in the container as possible. This is one of the reasons why little storage bags (specially designed for freezing breast milk) are preferred over bottles. Bags are easy to squeeze. The reason behind squeezing the air out is that when frozen, the air in the bag drains water out of the milk; the milk in its turn loses moisture and dries out – condition known as freezer burn. FACT 3: If you need to add fresh milk to the one that's previously frozen, chill it first. Also, make sure the added portion is smaller than whatever was already in the bag. * Here is why: Layering up milk for freezing is totally ok. The only thing we wouldn’t want to do is to add freshly-expressed milk to the frozen one without cooling it down first. If we did that, fresh warm milk would start defrosting the upper layers of the frozen milk, which would promote bad bacteria growth. Even more so, if the amount of freshly added milk is larger than the frozen portion. Moreover, with every freezing, milk anti-bacterial properties are slightly weakened. Freezing also destroys some white blood cells in the milk that are responsible for protecting against illnesses. One freezing doesn’t do much harm, and thawed milk is still superior to any formula; but we don’t want the milk to defrost and then re-freeze every time we add fresh milk to it. So always chill fresh milk before mixing it up with frozen. FACT 4: When milk separates, swirl the container gently to mix up the layers. Do not shake the bottle vigorously. * Here is why: Milk separation is normal. Fatter creamier milk usually separates into the top layer. Only store-sold milk doesn’t do that, as a result of homogenization – the process that divides fat particles in a way that they actually mix up with the rest of milk and water and do not separate. Breast milk fat contains long chain fatty acids that are crucial for baby’s brain, eye and nervous system development. If you shake the bottle, some of those valuable acids are bound to break, which is undesirable. Stick with swirling instead of shaking. 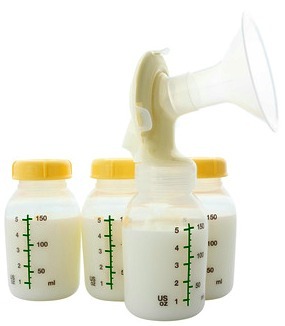 FACT 5: When expressing/pumping milk after a breastfeeding session, make sure to empty breasts completely. * Here is why: First of all, this is important for keeping up milk supply. Every drop of milk left behind gives your body a signal to produce a little less. Besides that, complete draining of the breasts insures hindmilk extraction. When the baby starts sucking, foremilk is the first to come. Foremilk is not as creamy, as the hindmilk. Hindmilk is the high-calorie part of breast milk. It is the last to leave the breast and is harder to get. If the baby gets full before completely emptying the breast, chances are the hindmilk is left behind. If that happens all the time, it may eventually lead to foremilk/hindmilk imbalance. The baby will get hungry faster, as the low-calorie milk is easier to digest and may not gain weight well. That is why, if your baby is done with the breast, but hasn’t drained it completely, it is important to pump the remainder of the hindmilk and use it for supplementation when needed. If you notice that it happens a lot, try pumping a little in the beginning of the feeding to increase your baby’s changes of reaching the hindmilk. FACT 6: When storing milk in the freezer, center the containers, keep them away from the sides and the door. * Here is why: Temperatures in the fridge and freezer always fluctuate, but even more so in auto-defrosting refrigerators. In these fridges the cooling element is heated for 10-15 minutes several times during the day to melt and remove the frost. When this happens, doors and sides are the first to defrost. Temperature in the center of the fridge and the freezer is the most stable, so there is less risk that the milk will start defrosting. 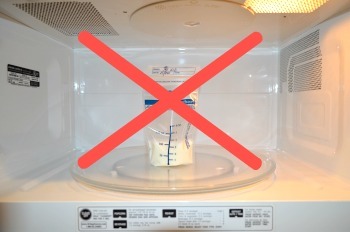 FACT 7: Do not microwave breast milk to thaw or warm it up. * Here is why: There are several things to consider here. First of all, heating in a microwave creates hot spots that can scald your baby’s mouth. Secondly, it destroys some protective and immunological properties of the milk. Thirdly, if you decide to warm it up in a plastic bottle, microwave heating may cause some chemicals to leak into the milk. FACT 8: If your milk has a soapy or fishy smell after defrosting, scald it next time before freezing. * Here is why: Breast milk contains enzyme – lipase – that breaks milk fat into smaller particles to aid with digestion. This break down is activated by temperature changes. Therefore, frozen and defrosted milk sometimes acquires this unpleasant taste. Keep in mind, that it is just the taste, the milk is still perfectly good. Most babies don't mind the taste or get used to it after a bit. If the smell does bother your baby, the best way to prevent this phenomenon is to scald (NOT boil) breast milk before freezing, which deactivates lipase and prevents unpleasant taste and smell. Keep in mind, scalding destroys some heat-sensitive immunological properties of the milk. Therefore, only scald the milk before freezing, if your baby refuses to drink it otherwise. Don't forget to cool milk down before putting it into the freezer. FACT 9: After the baby finishes the bottle, rinse it with cold water first, then wash it thoroughly with warm water and soap, and then rinse with cold water again. * Here is why: If washed off with hot water, breast milk proteins left over on the bottle become solid (coagulate), stick to the bottle and are harder to wash off. This is similar to what happens to an egg in hot water. By rinsing the bottle with cold water first, you get rid of this protein leftover. Warm water and soap then take care of fat and bacteria. Finish cleaning with another cold rinse to get rid of soap residue. While hot water works best on fat, cold water is a soap killer. Moreover, cold water rinse gets rid of any particles left from warm water that have been acquired in the process of heating. I know I went into many details when explaining some of the facts above, but I wanted to show you why these guidelines have the right to exist and need to be followed closely. If nothing else, we are handling baby food! Besides, it is always easier for me to remember facts, if I have a clear understanding of what lies behind them. What other little facts have you heard about milk expression and storage? I’d be glad to research them for you, so please do share by replying to this newsletter! There was one product that I wanted to test and review for a while. And since it was perfect for the topic of our discussion this month, I decided it was time. I am very pleased to announce that Eepples MilkCharm did great in testing and is a very functional, universal and easy-to-use device. I also love the company that stands behind this invention. Eepples stays as environmentally friendly as possible by using recycled materials for their products, manufacturing recyclable products and even recycling your MilkCharm for you when you no longer need it. I feel good about investing my "green" into a green company like this one! To order your MilkCharm, follow the link below, enter BFQUEST at checkout and enjoy Breastfeeding Quest's exclusive 20% off discount. Happy milk storing!